March 3, 2014, 10:44 PM · AUSTIN, Texas — Yehudi Menuhin said that two things make for a fine violinist: First, being a master of the instrument and a servant to the music; and second, accepting a social responsibility, to use music to bring people together and give them hope. That's what Aaron Menuhin told the young artists who participated last week in the competition founded by and named for his grandfather. 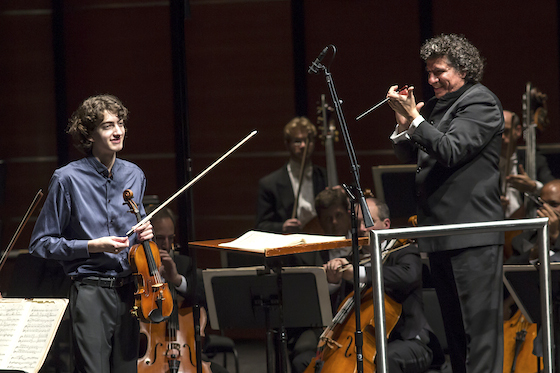 The Menuhin Competition concluded on Sunday with the announcement of special prizes and a sold-out Gala Concert at the Long Center for the Performing Arts in Austin. 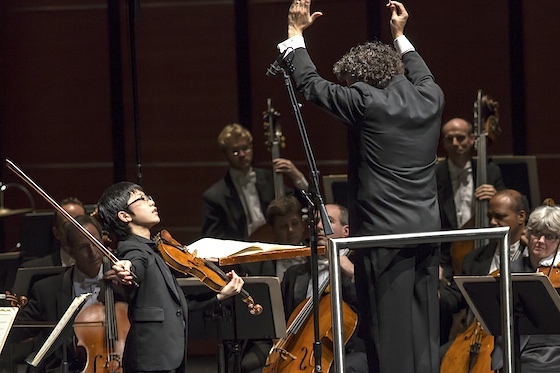 The concert featured first-prize winners Rennosuke Fukuda and Stephen Waarts performing with the Cleveland Orchestra, as well as a performance by jury member Arabella Steinbacher. At an awards ceremony preceding the concert, Butler School of Music Interim Director Glenn Richter said that the competition had brought a certain excitement about classical music to Austin, where the competition rounds and performances drew increasing crowds over the 10-day event. A children's concert that was given Saturday by the Cleveland Orchestra for local youth also put a spotlight on the special events going on as part of the Menuhin Competition. "The buzz comes from the talent of all the competitors," Richter said. "I think that Austin gets it." All unplaced Junior finalists receive US$500. After the ceremony I spoke to one alumnus of the competition, and also a Junior participant in this year's competition. "It is like a family -- all these guys will keep coming back," said Juilliard student Ariel Horowitz of the participants in the competition. An alumnus of the 2012 Junior Division Menuhin Competition, she had come from New York to help with the "Passing of the Bow" ceremony. She said that though she did not place in the 2012 competition, "it didn't matter at all. It changed my life and opened so many doors for me." "It definitely makes you practice more, seeing all these competitors," said Ari Boutris, 13, a Junior competitor this year. I asked him how he prepared for the competition, and he said that he had to work in his practice time between regular school and baseball, but it's a challenge. "A thirty-hour day would be helpful!" added his mother, Mika. "This is my first competition, so I'm learning so much, just being here," Ari said. "Hearing the judges play and the competitors play was so inspiring." 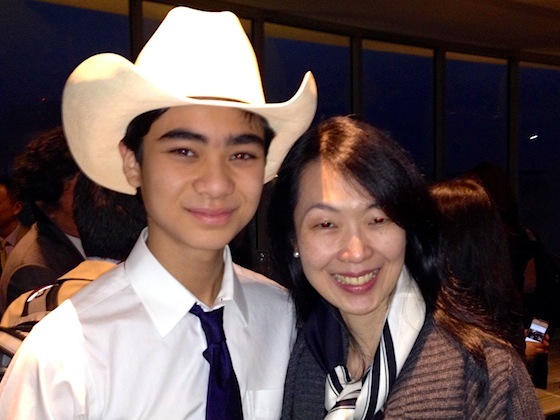 During the competition, he stayed with a family in Austin, and a Senior competitor also stayed at the same house. "It was so inspiring, just hearing him practice." He also enjoyed hearing more in detail what judges thought, when they gave master classes. The Gala Concert took place in the evening, and it began with the aforementioned "Passing of the Bow" ceremony. 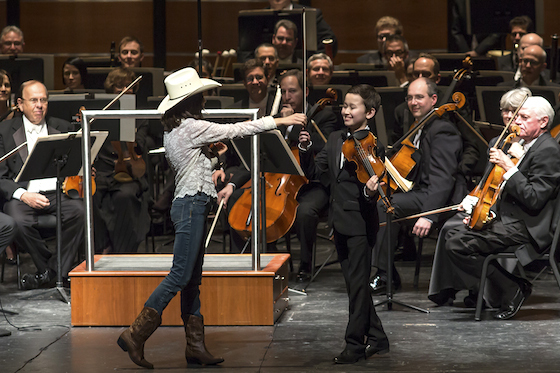 The 2016 Menuhin Competition will take place in London, so American competitor Claire Wells of Texas walked on stage, wearing her cowboy hat and playing some Texas fiddle music. She then passed the bow to competitor Daniel Lozakovitj (of Sweden, as there were no competitors from U.K.! ), who walked off stage, playing Elgar's "Pomp and Circumstance." The Cleveland Orchestra started with "Carnival Overture," followed by Junior First Prize winter Rennosuke Fukuda playing "Praeludium and Allegro" by Kreisler. Senior First Prize winner Stephen Waarts then played the first movement from Prokofiev Concerto No. 2. Next, Arabella Steinbacher, dressed in flashy hot pink, played Ravel's Tzigane with great flourish. One hears that piece played with piano so often, I enjoyed hearing the color of the orchestra part. Last on the program, the Cleveland Orchestra played Tchaikovsky's Symphony No. 5. It's frequently played, but what a treat, to hear it played so well. When the Cleveland Orchestra lets loose, they do so through such a focused channel; it's so powerful! I hadn't seen Giancarlo Guerrero conduct before now (in fact I haven't seen Franz Welser-Möst either, at first I thought it was him! ), and I enjoyed watching him. Whatever his gestures do for the orchestra, they serve as a great audience surrogate, as if one could simply conjure these kinds of sounds with those sweeping gestures. Cleveland's magnificent sound reminded me of the power of hearing music unfold live. It washes over the listener, the energy given off by the gestures of every single musician, the intelligence and intent behind each individual. It all culminates in a whole, in one live moment in time. This was full hall contained more than 2,000 people, on stage, in the audience. They all shared one experience: a wash of sound waves that vibrates the walls, the chairs, the program in my hand, the bones in my body. That's power. Big, Texas-style power. It can't happen through computer speakers; it can't happen alone in a room -- that's just not the same experience. As I left Austin Monday, waiting for a much-delayed flight back to Los Angeles, I picked up a T-shirt in the gift store. It says, "Austin, Texas: Live Music Capital of the World!" Of course, the words appear over an electric guitar, with a swirl of stylized piano keys and horn bells, and wings for special effect. Austin is a town with a proud tradition of live music, with singing on the street and a band in every pub. But as host to an international violin competition, Austin proved fertile ground for live classical music as well. May it grow! Ludvig Gudim: Hermann Janzen, 2013. 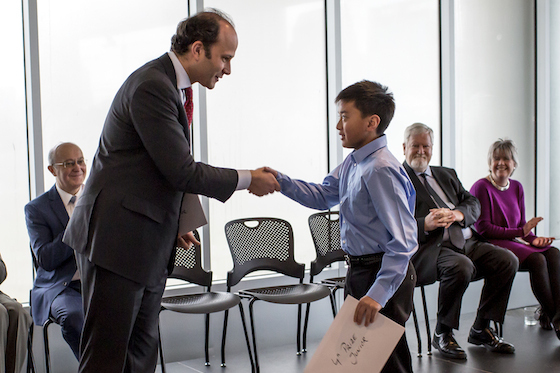 One more note: We're not yet finished with our coverage of the Menuhin Competition! I have a post from Brian Lewis' master class, as well as interviews with first-prize winners Rennosuke Fukuda and Stephen Waarts still to share with you. Watch for those later this week on Violinist.com. March 4, 2014 at 09:57 AM · Thanks for the wonderful interviews and coverage Laurie! It's been really great to follow this with you. Looking forward to the rest. March 5, 2014 at 04:59 AM · It's been great to see it all, and also to see that so many people take an interest in the young, emerging artists.